Pu`uloa petroglyphs showing several piko pukas. Dots with a ring indicates a first born child. The name Pu`uloa, translated as the "long hill" carries a kaona (hidden meaning)—"hill of long life". Families with genealogical ties to these lands come here to place the piko (umbilical cord) of their child. Their hope is that the mana (spiritual guiding energy) of Pu`uloa would bless that child with a long and properous life, and root them to their ancestral lands. Each puka (hole) is create to house a single child's piko. The Ancient Hawaiian culture lacked a written language, thus Pu`uloa provides a glimpse into the lives of those early Hawaiin people—their life experience, their struggles, and their successes. It is considered sacred to the people, and those of Kalapana in particular. Of over 23,000 petroglyphs found at Pu`uloa, 19,000 are piko-related etchings—a testament to the importance of both Pu`uloa and 'ohana (family). Pu`uloa petroglyph site showing the boardwalk surrounding the ancient rock art. Located in the ahupua`a (an ancient Hawaiian land division) of Panau Nui on the southern flank of Kilauea volcano, Pu`uloa contains a vast area covered with incredible numbers of petroglyphs pecked in the harden lava. The archaeological site of Pu`uloa is the largest petroglyph field in Hawai`i containing a diverse set of rock etchings; motifs containing cupules or holes (84% of the total) , motifs of circles, other geometric as well as cryptic designs, human representations known as anthropomorphs, canoe sails, and even feathered cape motifs. Changes occurring throughout Hawai`i led to variations in petroglyph tools, techniques, and styles. Petroglyphs were traditionally made using pōhaku (rock). A sharp stone was used to peck or incise precise impression into the lava surface, while a blunt stone created a bruised or abraded image. As the culture flourished, petroglyph styles evolved, and the tools used to create them diversified. 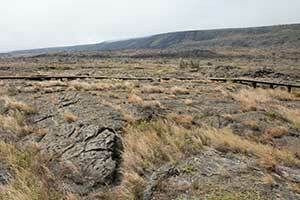 In geologic terms, the center of Pu`uloa consists of a volcanic pressure dome with outlying areas of ancient, relatively level fields of pahoehoe lava bedrock (pahoehoe, being one of the two types of lava found in Hawai`i, a rather smooth surfaced substrate), dated geologically between AD 1200-1450. Along the southern coast, both on the east and west sides, we frequently saw a number of straight lines, semicircles, or concentric rings, with some rude imitations of the human figure, cut or carved in the compact rocks of lava. They did not appear to have been cut with an iron instrument, but with a stone hatchet, or a stone less frangible than the rock on which they were portrayed. On inquiry, we found that they had been made by former travelers, from a motive similar to that which induces a person to carve his initials on a stone or tree, or a traveler to record his name in an album, to inform his successors that he had been there. July 1, 1914. Rode out to Puuloa on the line between Kealakomo and Apuki. Here is a large pahoehoe mound used as a depository for the umbilical cord at the birth of a child. A hole is made in the hard crust, the cord is put in and as stone is placed over it. In the morning the cord has disappeared; there is no trace of it. This insures long life for the child. Mrs. Kama, born in 1862, was a native of Kamoamoa. Her mother brought her cord there. She had 15 children and for each one at birth the visit was made to Puuloa. Another mound, on the southern boundary of Apukiu., called Puumanawalea, was similarly used...Puuloa is especially rich. There are holes, pictures, initials chiseled into the rock. Petroglyphs showing a dot with two rings indicating a first born child of an ali`i. A dot [puka] was "the hole for a child"
A dot in a circle "the hole for the first born"
A dot with two circles "the first born of an ali`i [a ruling chief]"
A plain circle was a "calabash"
A jagged line was a "mo`o [a lizard]"
A circle with a long line was a "puloulou [a tapa covered ball on a stick carried by an ali`i as a symbol of taboo]"
A cross with a dot at each end was "a cross before a chief at night in travelling." Thus, the interpretation of Hawaiian petroglyphs is not a solely aesthetic one. Though some very beautiful in their presentation, petroglyphs also serve a deeper purpose such as the spiritual binding of families. Generations of children and families are represented by the piko puka carvings. Each design is as unique as the individaul who created it. Some are carved deep, some shallow, while others are more extravagant, with multiple holes either in a circle, encircled, or as a line. These petroglyphs, regardless of style, unite generations of Hawaiian families past, present, and future. Other petroglyphs at Pu`uloa are interpreted to have recorded travel around the island of Hawai`i, express consideration for human longevity and well being, communicate events current and past, as well as mark boundaries and trails. In the past, taking a rubbing of a petroglyph image or chalking the outline was a practice some would undertake to create a copy or duplicate or to enhance a photographic image of a petroglyph. Today, we know that any abrasion, scuff, or rubbing to the petroglyph image damages the feature by exacerbating the erosion process, which brings about the eventual destruction of the resource. Advancement in the archaeological recordation process by utilizing photographic documentation, precise measurements, skilled illustrators, as well as the accumulation of data on petroglyphs allowing us to better understand the process by which petroglyphs are created, and the oral history to better understand the meaning behind the motifs, all aid in the advancement and protection of this important petroglyph site. One of the ways early park administration considered to protect the petroglyphs at Pu`uloa was to construct a boardwalk above the ground surface, elevating a pathway upon which visitors could walk and view a section of the extensive area and variety of petroglyphs at the site. Pu`uloa is made accessible with a parking area pullout and an emergency call box along Chain of Craters Road at Milepost 16.5. From the pullout parking area it is a 0.7-mile walk over a gently undulating pahoehoe lava bedrock trail to reach the boardwalk at Pu`uloa. Pu`uloa is not the only place within Hawai`i Volcanoes National Park that one sees petroglyphs created on the lava substrate. Single petroglyph images, petroglyph panels, and petroglyphs created in a linear or other pattern can be seen in many locations at the coast as well as along the slopes of Kilauea volcano, each serving its own purpose. i. Information courtesy of the National Park Service / Mara Durst, NPS Archeologist-HAVO July 2002.
ii. Pukui, Mary, S. Elbert and E. Mookini. Place Names of Hawaii. University of Hawaii Press, Honolulu. 1974:200-201.
iii. Emory, Kenneth, et al. Natural and Cultural History Report on the Kalapana Extension of the Hawaii National Park. Vol. I, Cultural History Report. Typescript, Bishop Museum Library Honolulu 1959:13.
iv. 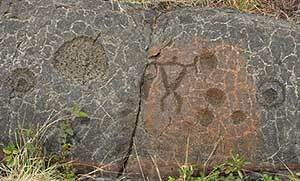 Lee, Georgia, and E. Stasack, Spirit of Place: The Petroglyphs of Hawai`i. Easter Island Foundation, Bearsville and Cloud Mountain Press, Los Osos, California. 1999:90.